Doug and the participants in his hotel training workshop. If you ask me, I think some luxury hotels end up with such disingenuous service because the staff is so overly focused on hitting the standards imposed on them by rating services such as AAA and FORBES that they are not able to connect with their guests on a humanistic level. Fortunately, there are ultra-luxury hotels and resorts that have fostered a service culture based on the true spirit of hospitality, while still ensuring that staff engage guests in a polite, gracious and dignified manner these rating service look for. One brilliant example is the Nizuc Resort Cancun. The first thing one notices as a guest is that each and every colleague you encounter – and I DO mean EVERY colleague – looks at you directly, establishes eye contact, smiles, and then places their right hand over their heart as they personally engage you. This happens every time with zero defect regardless of time of day, day of week, or how busy or slow the resort is. The best part is that it is completely sincere every time. For example, just this past week I experienced my third visit and like the others, it was for me all business as I was there to conduct training for their sales staff. Most of the colleagues, however, had no idea I was doing business with the hotel and therefore to them I did not stand out from the other guests. The Nizuc experience is notably different right from the start of any visit. When one arrives in Cancun, like other tourism destinations the arrivals area is a swarm of activity. There are dozens of drivers standing with signs displaying various logos and it’s always confusing to find your ride. However, the Nizuc drivers always seem to make their way to the front. Whereas some start such interactions with “What is your last name?” you will begin to experience the bespoken service from that moment on, starting with the Nizuc gesture and welcome as described above. I noticed as Alejandro roomed me that he tailored his conversation to my being a repeat guest and also to the purpose of my visit as a business traveler. One strong requirement of all luxury hotels and their rating service is for the bellperson to offer resort information and also to explain the features of the room, especially when there is lots of in-room tech as there is at Nizuc. Yet Alejandro didn’t force a script on me and instead asked something like “I know you have been our guest several times, but may I remind you of a few features of the room?” I also remember that he used some lighthearted humor when mentioning that my butler was also named Alejandro, and that I seemed to have attracted many named Alejandro that day. I could continue on to share with readers each and every encounter, including my wonderful room service attendants, my butler, my turn-down housekeeper, Daniel at the front desk in the morning and Gustavo at the door when I left for the conference center, but the story would be consistently the same. 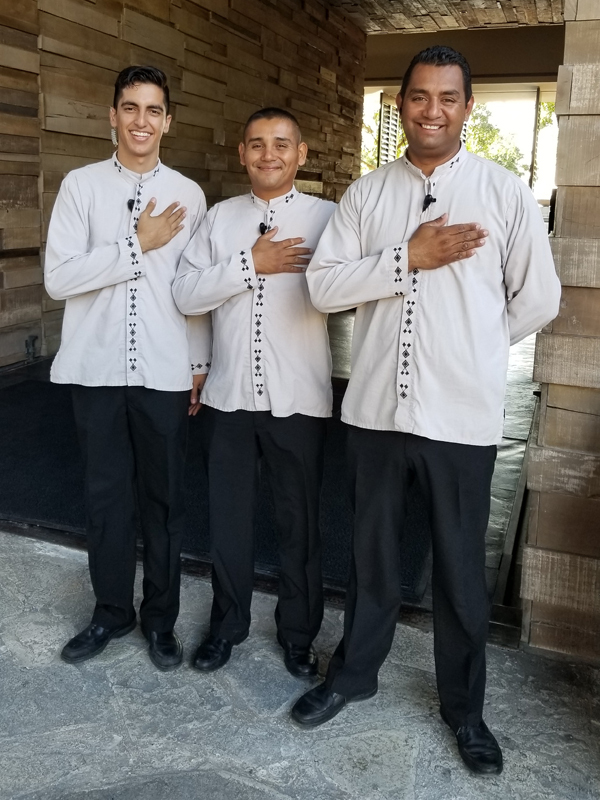 My observations would become redundant; each and every one of them exemplified the genuine, authentic, bespoken service style that I have come to count on from Nizuc Resort and each sincerely showed the same hand-over-heart gesture. However, what really inspired me to write this month’s hotel training article was one encounter that really stood out. After finishing up my workday returning emails from my room, I had just enough sunlight left for a brief jog on the resort grounds. I had my headphones on and was probably not looking too approachable, and it was also growing dark quickly. It would have been very easy for any colleague to pass right by me and skip their signature gesture. Yet I noticed how everyone I encountered still greeted me with the same qualities described previously and with their right hand on their heart as a smile broke out on their face. Finally, I encountered a gentleman who was wearing a culinary uniform – not of the Executive Chef type but probably a line cook. Some hoteliers call these folks “back of the house.” However, clearly this colleague knew he was part of the “heart of the house,” as he, like all the others, stopped walking, turned towards me, put his hand on this heart and delivered a warm smile.